A dozen adult learners have set the foundation for future building careers after they successfully completed their Construction Skills Certificate Scheme (CSCS) – allowing them to apply for job opportunities in the sector. CSCS is the leading skills certification scheme in the country’s construction industry. CSCS cards serve as proof that individuals working on building and development sites have the training and qualifications they need to do the job. The learners received their award from Islington Council’s executive member for economic development, Cllr Asima Shaikh, at a special ceremony at the Muslim Welfare House, in front of family and friends. 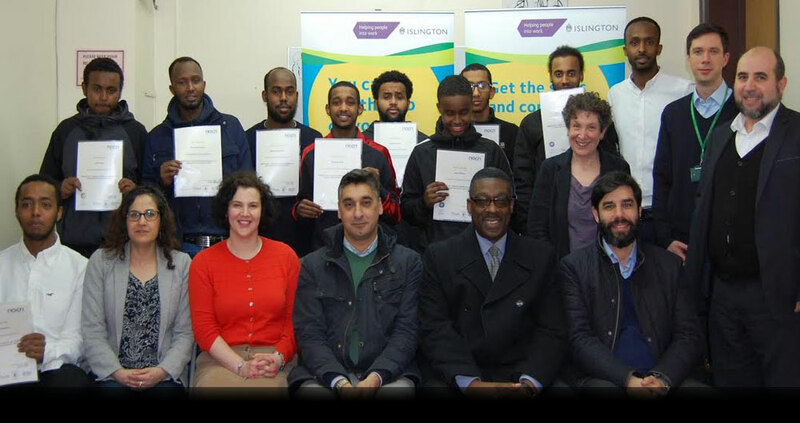 Their particular course was facilitated by Islington Council and Muslim Welfare House, in an effort to help unemployed people in Finsbury Park access local job opportunities – particularly on nearby construction sites – and to help boost the skills of local people from Black and Minority Ethnic backgrounds who are out of work. Two of the graduates are already in employment while Islington Council’s iWork and Youth Employment Team are supporting the others to find jobs in the borough. Speaking at the ceremony, Abdulhakim, from Finsbury Park and who successfully completed the course, said: “Opportunities like this are hard to come by. “Getting my qualification helped me progress and I’m sure it will do the same for the people who have graduated today. Cllr Shaikh said: “Congratulations to all those who received an award, which serves not only as a testament to their hard work but also as a strong first step towards a career in construction. Keen to enrol on our CSCS? Email iWork@islington.gov.uk or YouthEmploymentTeam@islington.gov.uk.